A TOP private Indian hospital offered Monday to examine an 18-month-old girl suffering from a rare but treatable illness that has caused her head to swell to more than double its normal size. The decision raises hope that eighteen-month-old Roona Begum, who suffers from hydrocephalus, a disorder which causes cerebrospinal fluid to build up on the brain, will get the life-saving surgery she urgently requires. 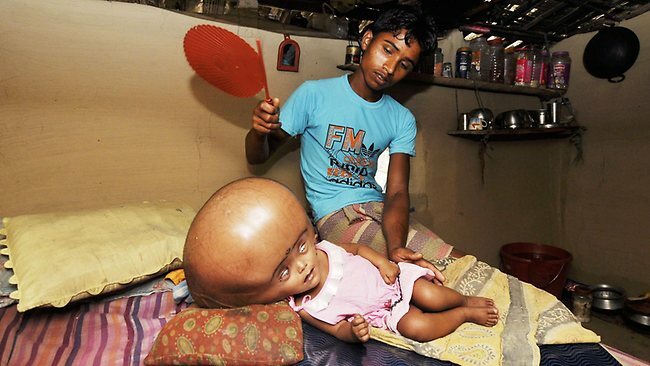 She was discovered last week living with her impoverished parents who are too poor to pay for treatment for the condition, which has resulted in her head swelling to a circumference of 91-centimetres (36-inches). The publication of pictures taken by an AFP photographer in remote Tripura state in northeast India last Friday led numerous well-wishers to step forward offering donations, while a website has been set up to collect money for her. Leading Indian neurosurgeon Sandeep Vaishya, who is the head of neurosurgery at a flagship hospital for the Fortis group near the capital, said that he would examine the girl and see if surgery was possible. "Fortis will fly her down and while we will have to do an MRI to check the condition of her brain, I am hopeful that we will be able to carry out a surgery and relieve the pressure on the poor child's brain," Vaishya told AFP. The group has a charitable foundation which carries out surgery free of charge. Her 18-year-old father, Abdul Rahman, who lives in a mud hut with his family in the village of Jirania Khola, told AFP earlier that only a "miracle" could save his daughter's life. The swelling is putting pressure on her brain and has made it impossible for her to sit upright or crawl on the ground. Local doctors had told the family to take the newborn to a private hospital in a big Indian city but the costs were too high for Rahman, an illiterate labourer who earns 150 rupees ($2.75) a day working in a brick plant. The US government's National Institute of Neurological Disorders and Stroke estimates about one in every 500 children suffers from hydrocephalus. The most common treatment involves the surgical insertion of a mechanism to drain cerebrospinal fluid away from the brain and towards another part of the body where it can be easily absorbed into the bloodstream. Extreme cases like Roona's are very rare, according to Vaishya, who said he had been deluged with calls about the child after he spoke to AFP on Saturday. 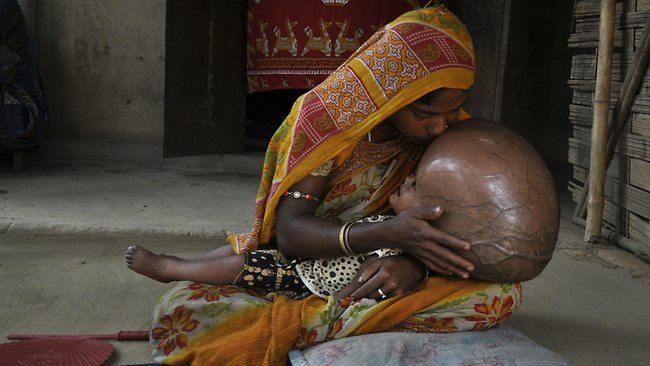 "The child must be in a lot of pain because her head is so heavy. Still, in the images I could see that she was smiling sometimes, which makes me think that her cognitive functions might still be intact," Vaishya said. Surgery to treat hydrocephalus is not particularly risky, Vaishya said. Gynecology problems grip from top gynecology hospitals in India resembling incontinence and prolapsed are a hardly any of the nearly all perturbing circumstances that can radically collision your eminence of living. In addition, many women with gynecologist since of alarm of humiliation.